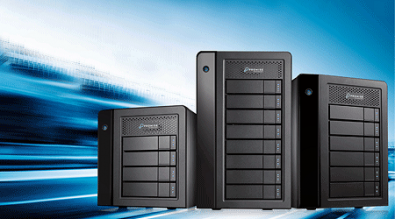 Promise has announced the Pegasus32, a dual-compatible connection storage device that allows the same USB-C port to connect at maximum allowed speeds via Thunderbolt 3 or USB 3.2 Gen 2. Promise said the Pegasus32 Series will include the R4, R6 and R8, and a bus-powered portable solution for OEMs. The new device now enables connectivity with the ability to connect at maximum allowed bus speeds via the same port to either Thunderbolt 3 enabled hosts at up to 40Gbps or USB 3.2 Gen 2 enabled hosts at 10Gbps. The Pegasus32 Series, using Intel’s latest TitanRidge Thunderbolt 3 chip, works on 8K monitors via the full size four-lane DP1.4 port and powers hosts up to 85 watts with Thunderbolt 3. The USB 3.2 Gen 2 port and has up to 112TB of raw capacity with the R8. Additionally, the line features HW RAID5+ protection, hot-swap 7200 rpm HDDs and dual Thunderbolt 3 ports to daisy chain.